According to Tullah Innes Hanley, her father was a Hungarian building contractor, her mother, an Egyptian, born in a harem and adopted by Hungarian parents. Her family became poverty-stricken upon the death of her father, leading, ultimately, to her coming to America. She was educated in Hungary and Switzerland. She could speak five languages, most likely learned on her many travels between Europe, South and North America. 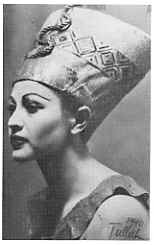 She appeared in musical halls, vaudeville, and night clubs with her unique classical Egyptian and African dances. She was fifteen when she began to dance and an "old" twenty-four when she married Mr. Hanley. They were married in 1948.
from "Beauty through Health and Culture"
She was a charismatic woman born for the stage. She had an overflowing passion for life and all that life had to offer. Her passions paralleled her husband's. She took an active role in choosing many of the works she and her husband would collect. 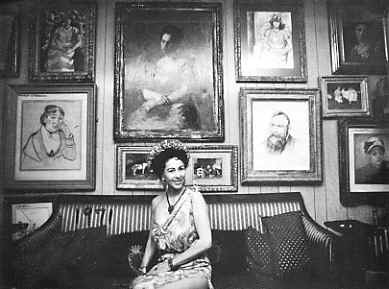 Throughout all Mr. Hanley's collecting Tullah always claimed that she was the only "ostentatious" thing he owned. Tullah also dabbled in writing and public speaking. She spent 6 years in the 1950's, writing The Strange Triangle of G.B.S., a novelized story of a love triangle involving George Bernard Shaw. She was active in the community, lecturing at the YWCA in 1959 on "Beauty through Health and Culture", and on similar topics over the years. Later in life, she wrote her autobiography entitled, The Love of Art and the Art of Love. After the death of T. Edward Hanley she continued the couple's philanthropy, donating generously to the University of Pittsburgh at Bradford and many other college libraries. She donated art and exhibited the pieces she kept all over the country. She even began a youth center in Mr. Hanley's home town of Bradford, Pennsylvania, a source of much comment in the small city. Tullah Innes Hanley died June 3, 1992. Bolton, Whitney. "Looking Sideways." Buffalo Evening News 14 March 1957: n.p. Canaday, John. "The Non-Immaculate Collection." New York Times 1 Jan. 1967: D19. Hanley, Tullah. Beauty through Health and Culture. N.p. : n.p, . Hanley, Tullah. Letter to Fr. Damian [McElrath]. 6 Oct. 1974. Hanley, Tullah. Love of Art & Art of Love. Hanley, Tullah. The Strange Triangle of G. B. S. Boston: Bruce Humphries, 1956. Sorensen, Lee. Determined Donor : T. Edward Hanley & His Gift of Books to the University of Arizona Library, 1936-1964. Tantallo, Alpha. "Art Collection's Owner Is Still Unaware of Theft." Olean Times Herald 27 August 1968: 4. Copyright © 2003 The Regina A. Quick Center For The Arts. All rights reserved.